If your kids are showing an interest in music, and you’re thinking about getting them their own instrument, you might have a few concerns. 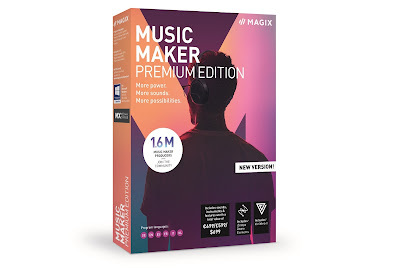 Professional-quality instruments, especially brass instruments like trumpets and trombones, can be extremely expensive and also very heavy for a child to handle. If only there was an instrument that was affordable, lightweight, and durable enough to be daily kid-handled? There is, baby – its called pTrumpet. The pTrumpet (the little ‘p’ standing for ‘plastic’) is a fully plastic trumpet that can create professional sounding music. 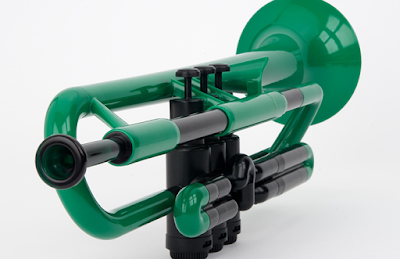 This is no cheap plastic toy trumpet, but rather a plastic trumpet that is as tough as a toy. It is a fully authentic musical instrument that can hit all the same notes as a traditional brass trumpet, but is light enough to be held and enjoyed by children (while also coming in several bright and funky colours). 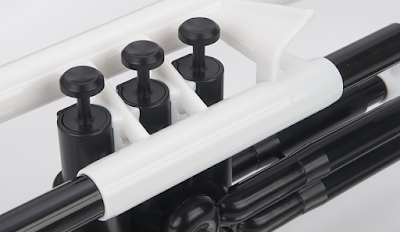 Hold it in your hand and you’ll see a full valve system, just as you would on a “real” trumpet. There are also adjustable sections on the tube, as well as a water key (where the spit comes out – gross) and a choice of two mouthpieces, a 3c and a 5c. Oh, and if your child (or indeed you) already has their own mouth piece from an existing trumpet, they’ll find it to be fully compatible with the pTrumpet. The pTrumpet weighs just 500 grams; less than half the weight of a brass trumpet. It also features a unique little finger rest, so hands both big and small can comfortably grip it while pressing the valves. With a little bit practice we were able to hold and play it with just one hand; the other being used to punch the air as we failed to toot out We Are The Champions. On that ‘note’ (that’s a music pun) the pTrumpet website is filled with lots of helpful hints and videos for kids to start playing – like really start playing, and not just blow it as hard as they can in the dog’s sleeping face. There are tips about getting your mouth in the right shape, as well as how to fine-tune the trumpet to get the right sound. It’s all very helpful and even the most tone-deaf idiot will be able to get a tune out of it in mere minutes. And… get this… it comes with its own CARRY CASE! Oh how we love a decent carry case, and the pTrumpet’s is a zip-closer with internal pockets for your mouth pieces and optional shoulder strap. Nice. 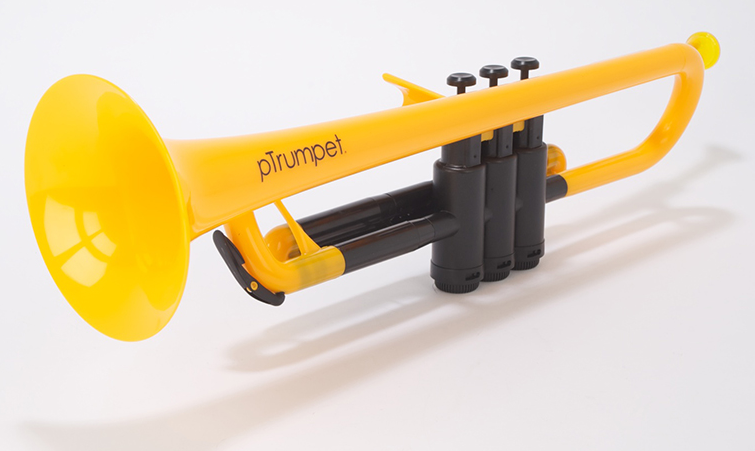 The pTrumpet is a fantastic way to get kids practising with a 'proper' instrument, and as it is made from tough plastic, you know they'll be able to do so while jumping around and having fun.